Is “blended learning” a trend? I think it would be easy to call “blended learning” a trend. It seems to be rather popular in education right now. There are lots of grants available to support it. Instructional technology is a common talking point among reformers. Many teachers in many schools are experimenting with it, some with fantastic results. Others with frustration. Blended Learning has been on my mind recently as it has become the current focus of my professional work. And to answer my opening question, for some, I suspect it is a trend. Write a grant, get some cash, buy some tech, generate some buzz. That’s how you take advantage of a trend. But for some, there might be more there. The reason that I have a hard time calling blending learning a trend or a fad is because of what is driving it. Or should be. For many, myself included, it is being driven by an appreciation for the educational opportunities that in the internet provides that aren’t nearly as available without the internet. Flipping classes, collaboration, cross-curricular projects, etc — this stuff existed prior to the internet. But never have those tools been so available and so easy to implement and adapt. That completely depends on whether or not we are prepared to allow blended models to address our most pressing issues. I’ve written about this before. Blended learning is no magic bullet. Blended learning is an opportunity. Nothing more or less. It can be capitalized upon or it can be wasted. As with all opportunities, in order to take advantage of it, you need to be waiting for it. You need to be expecting it. You need to know why you are looking for it and what you expect to be able to use it for. Because make no mistake, underperforming students and schools aren’t underperforming BECAUSE the students haven’t been using the internet. Therefore, simply involving the internet in their schooling isn’t a meaningful end. 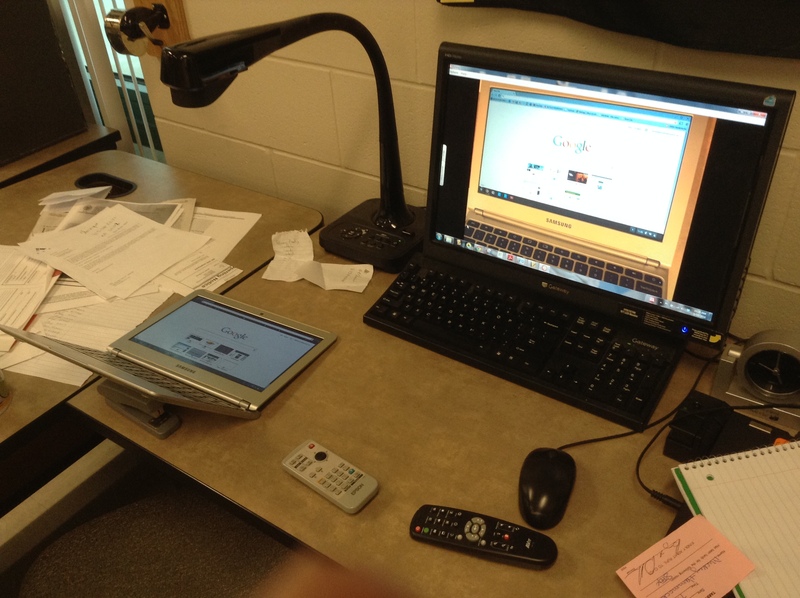 Blended learning is a how, it’s a means. A means to what? When I heard that portion of the talk, I replaced “to make a profit” with “to improve student achievement.” Re-read the quote with that update. Improving student achievement shouldn’t be a why. It should be a result. What is our compelling “why”? Why should we blend offline and online resources to create a new educational model? What is the value the model? What transformation are we trying to create? Why will our students have access to a more powerful experience because of it? The “whys” that we choose will drive our ability to create blended learning opportunities that have value instead of those that are blended because that is what folks are doing these days. They will energize us when our work exhausts us. They will help us to motivate our students when they (and perhaps we) are tempted to think that engaging a new learning opportunity is too much work. Those moments are real. And when it comes time to push through them, it isn’t the “what” that inspires. I suspect there will be teachers and schools that implement blended learning with fantastic results. I also suspect there will be teachers and schools that will implement blended learning and be very disappointed. It will depend completely on the “why” at the center of the golden circle. What will separate the two is the effort and energy spent developing the why. I just finished up a day on campus at Michigan State University attending the Michigan Virtual University Symposium. It was a daylong set of discussions and panels dedicated to blended and online learning. Toward the end of the day, in the final panel discussion, the value of failure came out multiple times. The process of learning REQUIRES a certain amount of failure. Failure lets us know that we are pushing ourselves to grow. Failure is a sign that we are trying to put new understanding into practice. Failure gives use opportunities to check our progress toward a goal that sits out in front of us… a goal we haven’t reached yet, but continue to reach for. We should fail sometimes and our students should see us do it. If we are really trying to show our students that we are lifelong learners, then we need to show our students what learning really looks like. Many, many students are under the unfortunate impression that failing is something that weak students do and succeeding something that strong students do. While, the latter is certainly true, the former is certainly not. Failing is something that happens with practically each first try at a new skill. Failing is something that is a natural part of the learning process. It is natural and it is helpful. I am not sure this education system of ours is encouraging that fact – not of its administrators, teachers, or students. We expect progress now. We expect implementation to demonstrate immediate results. We want our teachers to teach in such a way that our students don’t get wrong answers. Perhaps what we need to do is get back to the basics of learning. If at first you don’t succeed, try, try again. This month, my journey in education takes a turn in a new direction. Thus far, all of my experience in education has been directly working with students, both teaching and coaching. (Well, with the exception of a short stint as a night custodian at a middle school when I was a freshman in college.) Teaching is a role that I have grown quite comfortable, but sometimes opportunities come along that give you a reason to consider other options. So I will be leaving the classroom. I’ll be heading to join an exciting team (headlined by @HeidiGascon and @t_becker10) a few miles south of my house. I will be asked to specialize in instructional technology. I do not consider myself an expert in this field. I will be asking for lots and lots of help from all of you. In addition to learning and growing in my knowledge of instructional technology, I will be asked to explore (and provide insight) on the whole spectrum of k-12 instruction… all grades and all subjects. I will be asking for lots and lots of help from all of you in this, too. There are some excellent opportunities for personal growth in this new role and as you all have helped me grow into my role as a math teacher, I wonder if you’d continue to help me grow into my new role as a specialist in instructional technology. My goal is to continue this blog. I would love to continue to discuss math, instruction, assessment, and learning with you. It’s been great so far. I am sure that I’ll be offering other insights and seeking other types of discussions as well. I look forward to where this is going to take us as a community.